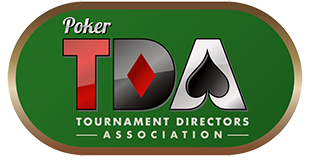 The TDA is the official association of poker tournament personnel. The Association is dedicated to the advancement of the industry and adoption of uniform poker tournament rules. The TDA was founded in 2001 by gaming professionals Matt Savage, Linda Johnson, Jan Fisher, and David Lamb. Since inception, the Association has grown to over 2,500 members in 63 countries. Joining the founders on the Board are industry veterans Jack Effel, Neil Johnson, Tab Duchateau, Johnny Grooms and Mike Bishop. TDA membership includes management staff from the world’s largest casino poker rooms, tour circuits, poker leagues, online tournament platforms, and independent tournament contractors. Every two years the Association holds a TDA Summit to review proposed new rules and amendments. To date, 66 rules have been adopted by the Association. The Official TDA Rules are available here. For more information on the rules process and a pictorial history of TDA Summits, click here. You are encouraged to consider joining the TDA. Members can actively participate in new rules legislation, attend Summits, and post in our online discussion forums. Membership is free. Click here for more information on joining the TDA. If you have any questions about the TDA or about a particular rule, please contact us. We look forward to hearing from you!